The candidate of the Peoples Democratic Party (PDP), Ahmadu Fintiri, has been declared as winner of the Adamawa State governorship election. The Returning Officer for the election, Prof. Andrew Haruna, declared the result on Friday morning in Yola after the supplementary election in 44 polling units across 14 local government areas of the state. 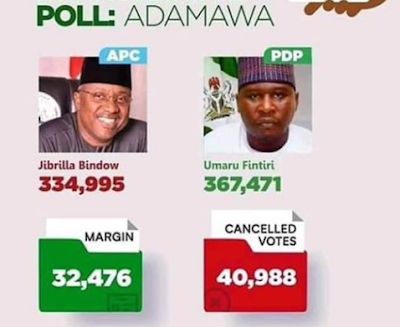 Haruna said Fintiri polled 376,552 votes to defeat incumbent Governor Jibrilla Bindow of the All Progressives Congress (APC) who got 336,386 votes. The Returning Officer said Sen. Abdul-Azeez Nyako of the ADC scored 113,237 votes to place third, followed by Emmanuel Bello of the SDP, who garnered 29,792 votes. 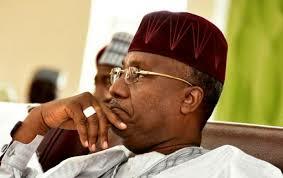 Fintiri, who was the Speaker of the Adamawa House of Assembly in 2014, also served as Acting Governor in July 2014, following the impeachment of the then Governor Murtala Nyako.